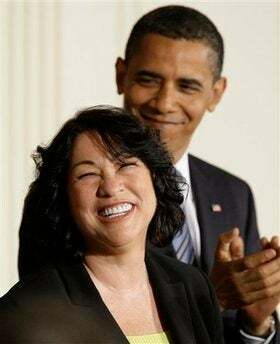 "Some say," Barack Obama offered this morning, by way of introducing his Supreme Court nominee, "Judge Sotomayor saved baseball." True, at least to the extent that Sonia Sotomayor saved baseball from itself. What Obama didn't say: Sotomayor totally screwed over Maurice Clarett. One case in particular involved a matter of enormous concern to many Americans, including me: the baseball strike of 1994-1995. (Laughter.) In a decision that reportedly took her just 15 minutes to announce, a swiftness much appreciated by baseball fans everywhere — (laughter) — she issued an injunction that helped end the strike. Yes, everyone had a good chuckle over this, because it's just sports after all. But it was Sotomayor herself who, as a federal district judge in 1995, pithily and forcefully declared that something larger was at stake in the baseball strike, a fact ignored by the sort of facile people who dismissed the work stoppage as a pointless dispute between athletic millionaires and short billionaires. "This strike," she said, in the same courtroom where Curt Flood lost his bid for free agency in 1970, "has placed the entire concept of collective bargaining on trial." Ruling from the bench, she directed owners to restore free agency and salary arbitration while bargaining continued and in doing so effectively ended the strike. It was a headslappingly obvious decision; Sotomayor famously needed only 15 minutes for deliberation. I asked former players union head Marvin Miller about the ruling. "It was an open-and-shut case," he said this morning. "You can't unilaterally change what has been negotiated. I'm not trying to minimize what she did. An awful lot of judges fold even in obvious cases. What she did was simply to apply the law as the NLRB [National Labor Relations Board] and the courts had already determined. But when a judge straightens it out in a sentence or two, that's marvelous." In the panel's ruling, Sotomayor held that the age rule, which requires a player to be three football seasons removed from high school, fell under a labor exemption to anti-trust laws — bear with me here — and in effect had been collectively bargained by the NFL players union (even though the rule appears nowhere in the collective bargaining agreement). It's a tricky opinion that simultaneously restricts a worker's right to earn and buttresses a creaky, paternalistic rule dating back to the days of Red Grange, but, more progressively, treats the act of collective bargaining — no matter how ineptly one side may be bargaining — as sacrosanct. It's also an infuriating opinion, one that, thanks in large part to the NFLPA's much-documented incompetence, basically countenances the collusion at the heart of our sports leagues' age requirements. In recent weeks, conservatives have gone bark-at-the-moon loony over Obama's stated desire for a Supreme Court justice who rules with "empathy." The Clarett decision, at least, was anything but empathic — it was a cold-eyed and literal-minded ruling from a judge who is nevertheless destined to spend the next hundred news cycles being branded a fire-breathing anarcho-syndicalist by the idiot right.